This collection of residences can be found at St Lucia’s celebrated Val des Pitons Unesco World Heritage Site. 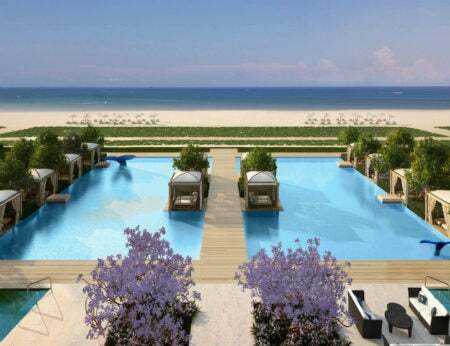 As a part of Sugar Beach, a Viceroy Resort, residents of the five properties have access to the five-star hotel’s services and facilities, while providing unrivaled privacy. As well as private access to the white sand beach they lie alongside, residences are met with views of the Pitons, rainforest and Caribbean Sea. Designed by the revered architect firm Michaelis Boyd Associates, the luxurious four- and five-bedroom homes sit harmoniously within their surroundings, featuring timber walkways suspended alongside reflection pools, natural timber exteriors and an open-plan design. Floor-to-ceiling sliding doors connect the living and dining areas with the outdoor terraces and pool, achieving an indoor-outdoor living concept.